Elegant Executive Home available in West Dover. 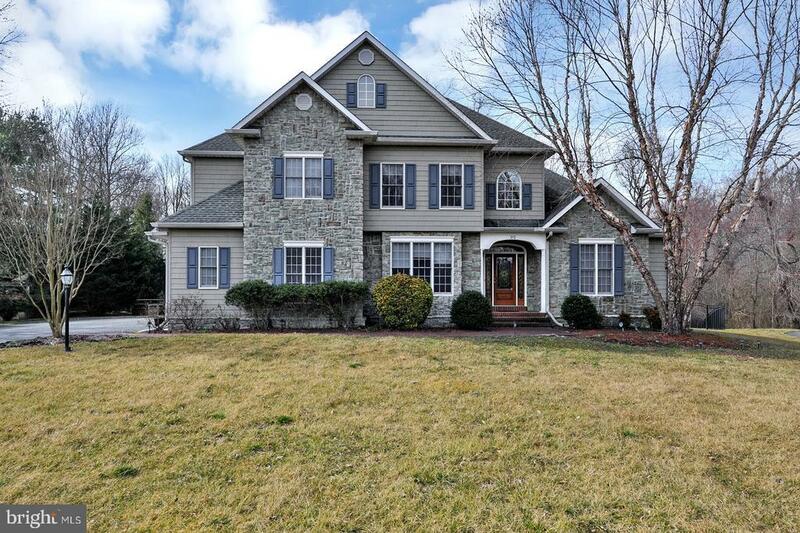 This stone front beauty is packed full of features and upgrades that you just cant miss. From the professionally landscaped front yard that has an irrigation system, to the uplighting that highlights the beauty of the home, you know youve arrived at a place where all details have been well planned. From the moment you walk through the front door, youre greeted with hardwood flooring and an expansive great room with cathedral ceilings. In the dining room, youll find formal chair rail and crown molding and enough room for a table for 12. Turn to the left, and you pass by the half bath and flow into the gourmet kitchen equipped with a Bosch dishwasher, Jen Air wall oven, and Sub Zero built-in refrigerator. With Corian countertops on custom Amish-crafted cabinetry, this really is a cooks dream. Theres also a full pantry and brightly lit eat-in area that overlooks the back yard. It adjoins the family room, keeping in tune with the open concept feel. The family room holds one of the two fireplaces, and also allows entry to the raised deck overlooking the mature trees and expansive back yard. On the other side of the first floor is the master suite. Given that its away from the kitchen and family room, it really is a quiet space for you to unwind. On top of a light and airy sitting area thats decked out with a tray ceiling and ceiling fan, there is California Custom Closet in the walk in closet. The attached master bath is spa like, with whirlpool tub for two, stand up shower, his and hers vanity and a private toilet. Upstairs youll find 3 other bedrooms large enough to accommodate king sized beds. The larger of the 3 bedrooms has an en-suite bath. The other 2 bedrooms share a Jack and Jill bath. All the bath cabinetry in the home is also custom made, and bedroom closets are walk-in. As much tranquility as the home provides, it also makes an excellent home for entertaining, with a full finished basement fitted out with a custom bar. There are 2 doors exiting the basement, giving you access to the concrete patio; all excellent places to entertain. To round out this expansive home, there is a 3 car attached garage. Nestled on a private cut-de-sac in the secluded development of Baltray, you will be close enough for North Rt 1 access and the Chesapeake Bay Bridge yet hidden from the bustle of city living. Dont hesitate to take a tour; call today.